Want to enjoy the downloaded MP4 videos on your new iPhone on the go? Sometimes you may fail to play MP4 on iPhone. That's because the compressed way for MP4 video can be different and complicated. iPhone can only recognize file with .M4V, .MP4, and .MOV extensions and compressed in H.264 or MPEG-4. If your MP4 file is not compressed in this way, it can't be opened or played smoothly with your iPhone. You need to convert MP4 to iPhone compatible format first. Here, this MP4 to iPhone Video converter is highly recommended. 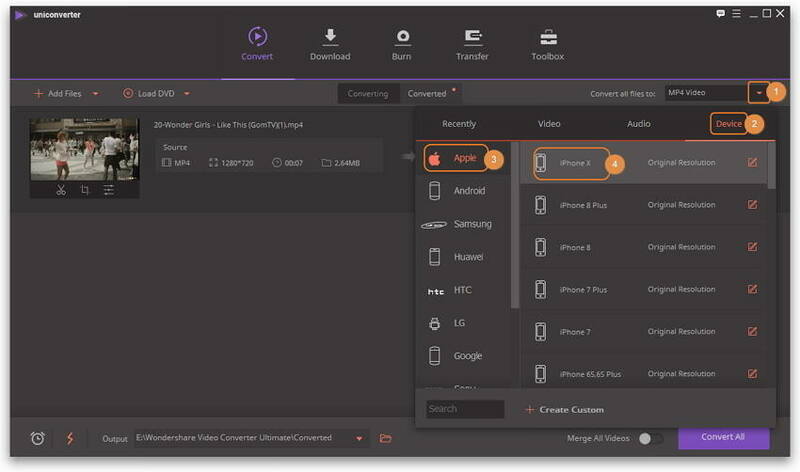 Convert any video to optimized preset for almost all of the devices, like iPhone, iPad. You can just set your iPhone as output format without thinking about the specific format or codec supported by your iPhone, saving you a lot of trouble. You can drag and drop any multimedia files into this video converter for iPhone, and then batch convert them to your desired format. Want to make your downloaded movie looking like those purchase from iTunes? This application can easily make it. It can add film cover, comment, description to your video. 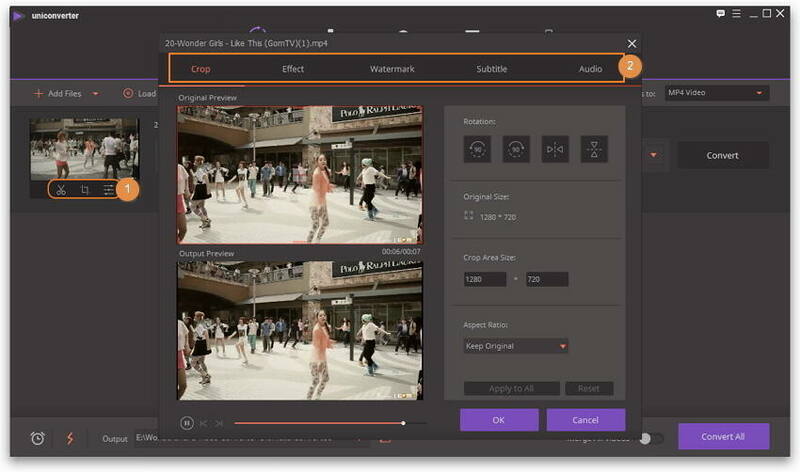 You can play your talent to customize your video with various effects, or your can trim, crop your video and add subtitles to it. How to Convert MP4 to iPhone (iPhone X/8/7 Included) for Playback? Step 1 Import MP4 file(s) to this MP4 to iPhone converter. Start Wondershare UniConverter after the installation. You can either click Add Files button to import MP4 videos, or directly drag and drop MP4 files into the program. UniConverter fully supports batch conversion, so you can add multiple videos for conversion at one time. Step 2 Choose the output format as iPhone. After adding the video into this video converter, you can click the drop down icon of Convert all files to: at the top right corner of the main interface. Then select Device > Apple > iPhone model. Note: This program also provides editing feature which enables you to modify video before conversion. This video converter provides most helpful editing functions, including trimming, cropping, adjusting, watermarking, and adding subtitles. If you want to edit videos, you'll only need to click one of the editing buttons under the video thumbnail. Step 3 Start MP4 to iPhone conversion. Click Convert All button to start converting MP4 to iPhone. When the conversion finishes, you can click the icon at the bottom of the Converting tab or click the Converted tab, and click the icon beside the video to enter the video location folder. Additionally, you can transfer the videos to iPhone for an enjoyment on the go, learn more about how to transfer video to iPhone. Note: When the conversion completes, the converted video will automatically add to your iTunes library if you have done the setings: Preferences>Convert> Automatically add files to iTunes Library after conversion. An alternative way to convert MP4 to iPhone free is using MP4 to iPhone video converter online. There are many free tools to convert MP4 to iPhone, but all of them have the size limitation and reply on the Internet speed. 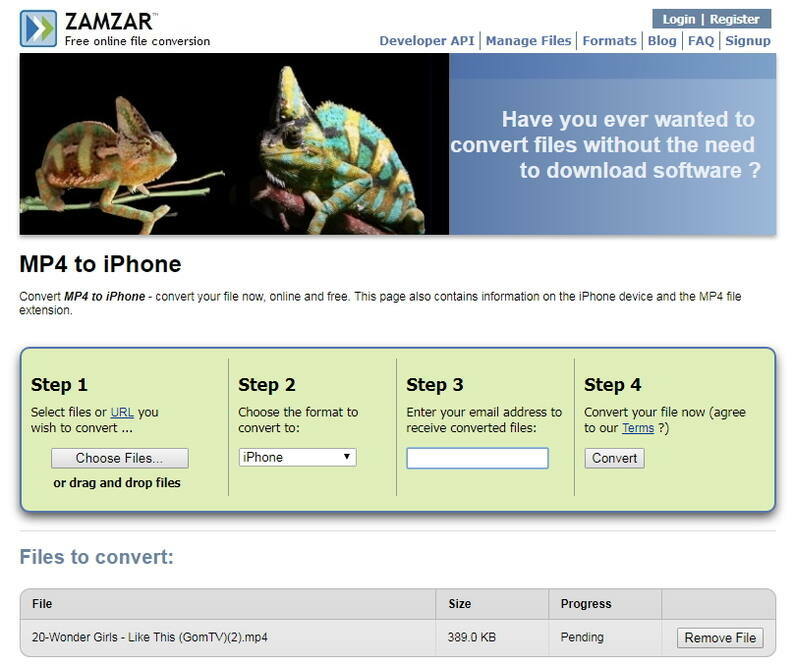 But if you're a temporary user for converting MP4 to iPhone, we recommend you to use one of the best online converter Zamzar. This online free video converter enables you to convert videos to the most popular video formats, including the iPhone-compatible video format. But the conversion speed is a little slow, if you don't care about the time and video quality loss, just have a try. But if you're a video fan who requires the high-speed conversion with less quality loss, download and use Wondershare UniConverter now.